Resistive touchscreens provide good durability and value, with reasonably good clarity. The 5-wire provides excellent touch durability because the touchscreen can remain functional with some types of damage, such as a scratch or break in the top layer. The resistive screen has been widely used in demanding environments, including retail, hospitality and other harsh workplaces. 5 Wire Resistive screens provide a reasonable life expectancy and hold up well when in contact with typical fluids used in these types of environments, including coffee, vinegar, cleaning detergents and gasoline. Resistive technology consists of two display overlays, each with a conductive coating on the inner surface. The conductive inner layers are separated by spacer dots, evenly distributed across the active area. Finger pressure causes internal electrical contact at the point of touch, supplying the touchscreen controller with vertical and horizontal voltages that get translated to a particular screen position. Surface acoustic wave (SAW) features image sharpness and clarity as well as touch accuracy. These features make SAW screens easy to use and enhance the overall usability for the novice user. gaming environments. SAW features excellent touch durability because it does not utilize any overlays or coatings. However, while SAW reasonably withstands contact with typical fluids used in retail and hospitality environments, the screen does not completely seal, allowing many types and quantities of contaminants to negatively affect performance. 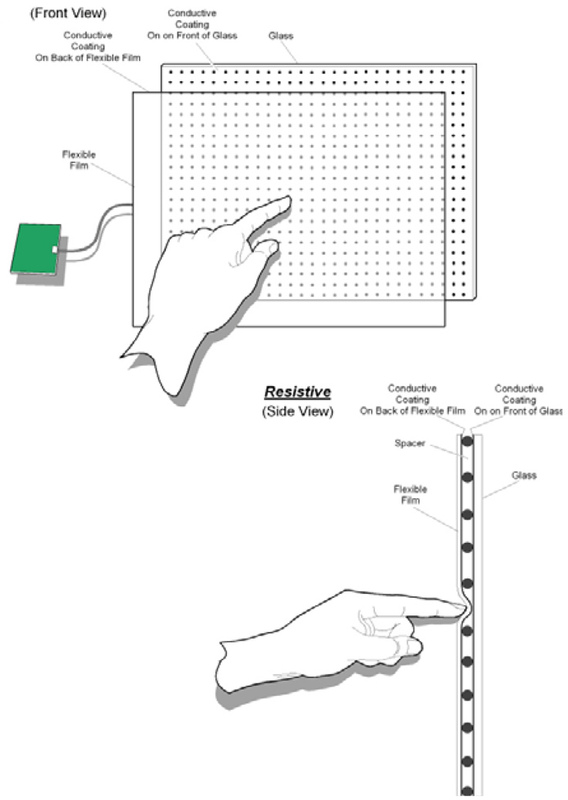 A SAW touchscreen uses a solid glass display overlay for the touch sensor. 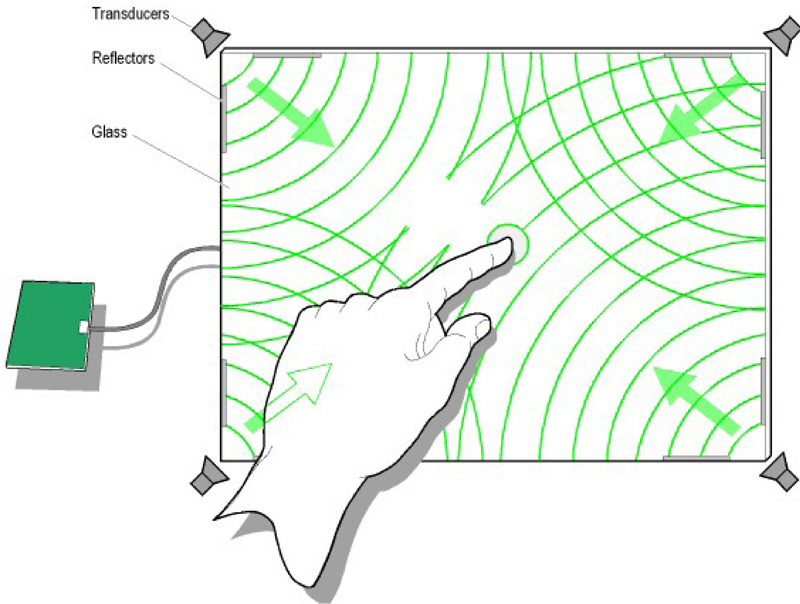 Surface acoustic (sound) waves, inaudible to the human ear, transmit across the surface of the glass sensor, one for vertical detection and one for horizontal detection. Each wave spreads across the screen by bouncing off reflector arrays along the edges of the overlay. Receivers detect the waves, one for each axis. When a finger touches the screen, the finger absorbs the waves, causing the screen to detect a touch.